Visitors in the courtyard of the Fleet, Chamber’s Book of Days, 1863. 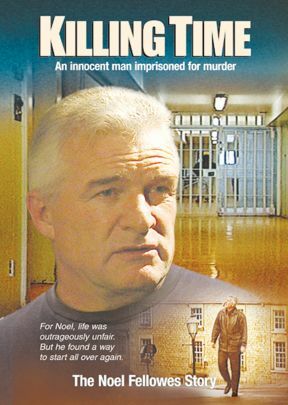 Recently we featured an excerpt from Chamber’s Book of Days on forced marriages at the Fleet prison. 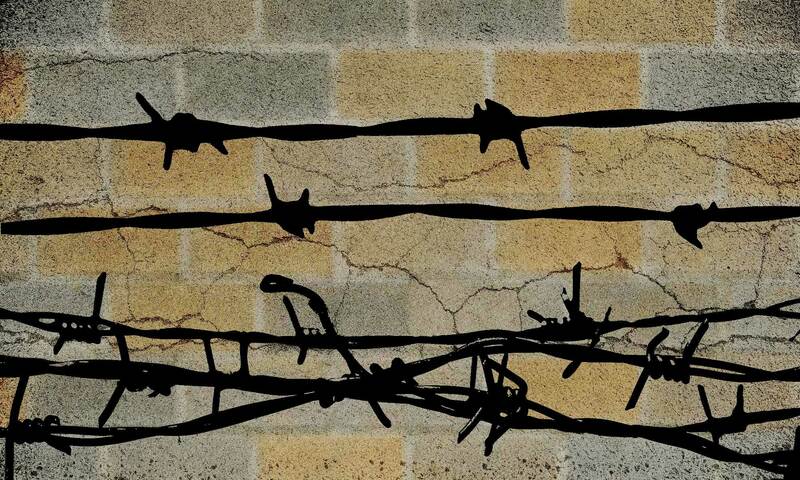 Here is another harrowing tale from Chamber’s about that terrible prison. 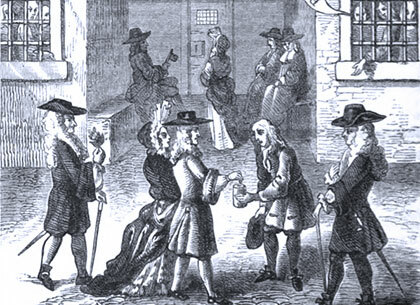 In the spring of 1727 a Committee of the House of Commons, appointed to inquire into the management of debtors’ prisons, brought to light a series of extortions and cruelties practised by the jailers towards the unfortunate debtors in their charge, which now appear scarcely credible, but which were not only true, but had been practiced continually for more than a century by these monsters, who had gone on unchecked from bad to worse, until this commission disclosed atrocities which induced the House of Commons to address the King, desiring he would prosecute the wardens and jailers for cruelty and extortion, and they were committed prisoners to Newgate. Hogarth has chosen for the subject of one of his most striking pictures the examination of the acting warden of the Fleet—Thomas Bambridge—before a Committee of the House of Commons. In the foreground of the picture a wretched prisoner explains the mode by which his hands and neck were fastened together by metal clamps. Some of the Committee are examining other instruments of torture, in which the heads and necks of prisoners were screwed, and which seem rather to belong to the dungeons of the Inquisition than to a debtors’ prison in the heart of London. Bambridge and his satellites had used these tortures to extort fees or bribes from the unfortunate debtors; at the same time allowing full impunity to the dishonest, whose cash he shared. At the conclusion of the investigation, the House unanimously came to the conclusion that he had wilfully permitted several debtors to escape; had been guilty of the most notorious breaches of trust, great extortions, and the highest crimes and misdemeanours in the execution of his office; that he had arbitrarily and unlawfully loaded with irons, put into dungeons, and destroyed, prisoners for debt under his charge, treating them in the most barbarous and cruel manner, in high violation and contempt of the laws of the kingdom. Yet this wretch, probably by means of the cash he had accumulated in his cruel extortions, managed to escape justice, dying a few years afterwards, not as he might and ought to have done, [hanged] at Tyburn, but by his own hands.